Hello wine lovers and happy wine Wednesday! I trust your week is going well so far and you are keeping healthy and well. 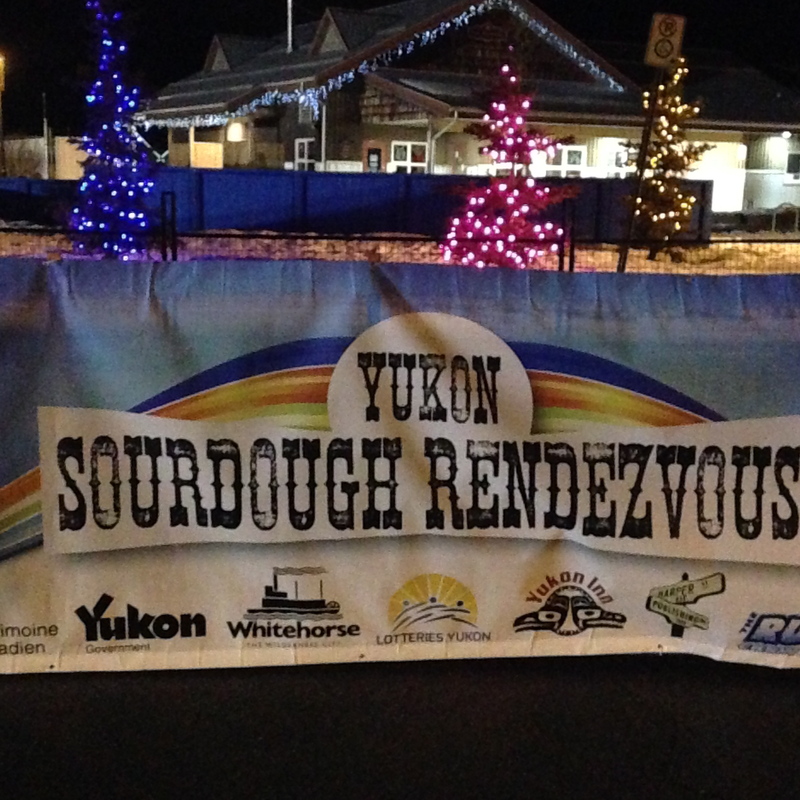 As you know, I headed up to the ‘Great White North’ on Thursday to experience some Whitehorse hospitality during Sourdough ‘Rendezvous’. I wasn’t sure about the quality of wine I would find in the Yukon, but I was more than pleased. The restaurant with the BEST wine list, in my opinion, was G & P Steak House – with a nice array of wines by the glass as well as great wines by the bottle at reasonable prices…hurray! I even spotted a few bottles of Lanson’s ‘Extra Age’ Champagne in the Liquor Store! 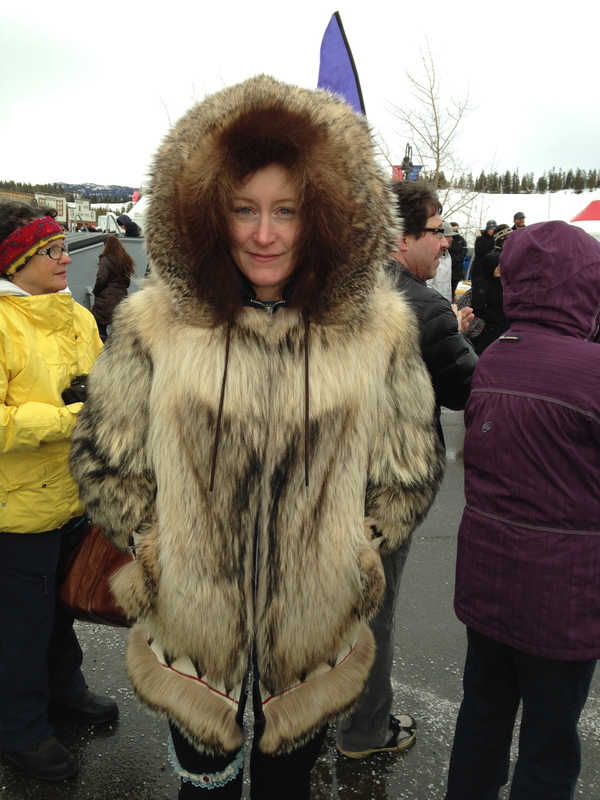 I had a wonderful time in Whitehorse and got to take in events like the ice sculpture competition where artists came from around the world to participate and the ‘chainsaw toss’…yes, you read that right. 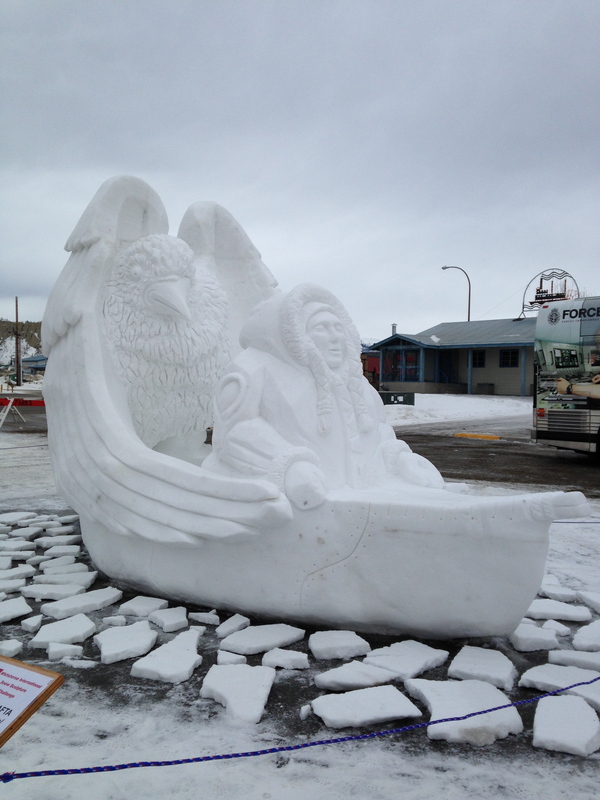 Winning Ice Sculpture from the NAFTA team…stunning. Best jacket of the weekend. I really did have a wonderful time in Whitehorse and would like to go back and enjoy more of the countryside …thank you for your amazing hospitality. If you plan on going, be sure to visit Antoinette’s Restaurant, G & P Steak House, and The Gold Pan Saloon. You will not be disappointed. 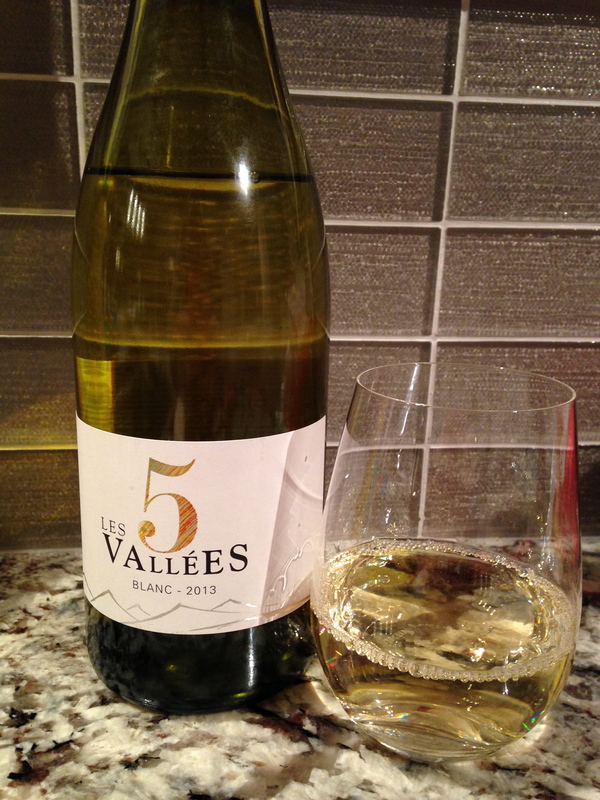 OK, on to the wine of the week – my review is on Les 5 Vallées Blanc 2013. I picked up this wine at Everything Wine on a whim for $15.99. It is a white blend, and when I say blend, I am not kidding! This blend consists of Grenache Blanc, Chenin Blanc, Mauzac, Vermentino, Chasan and Sauvignon Blanc…whew! Les 5 Vallées Blanc is a Pays d’Oc IGP wine which means the grapes are sourced from both the Languedoc and Roussillion regions of France. It is not classified as an AOC wine but it is the mid level of wine, above table wine. In the glass, this wine is a nice bright pale lemon colour with youthful aromas of cantaloupe and honeydew melon, pineapple, tangerine with an underlying zip of lime zest and a whiff of almond skin. On the palate, it is one refreshing wine – a bit acidic in my opinion – due to flavours of grapefruit pulp mid-palate. It is high in acidity with medium body and a medium flavour profile with loads of citrus – oranges, lime, tangerine, white flowers and less of the melon fruits but they are present. It is quite juicy and delicious even with the grapefruit skin and pulp that comes back, but I am a HUGE fan of grapefruit and honestly, can’t find enough of it in wine so I am thrilled to have happened upon this glass of happiness! The finish is medium with some floral back notes – very distinct. This is an interesting blend of six unique wines that present themselves as a very vibrant blend that I see pairing deliciously with a fresh grapefruit salad or seafood with a grapefruit sauce. I would buy it again. This falls firmly within my ‘In The Mood?’ category for you white wine lovers who are looking for a bit of a detour to their regular purchases. Fun – I love a good surprise and this was one! This week I am going full tilt as it is the Vancouver International Wine Festival. I will be attending about four events and will report back on them next week. The focus grape is Syrah or Shiraz and the country focus is Australia. Have a great week! Do let me know if you will be at the festival and hopefully we can meet up! 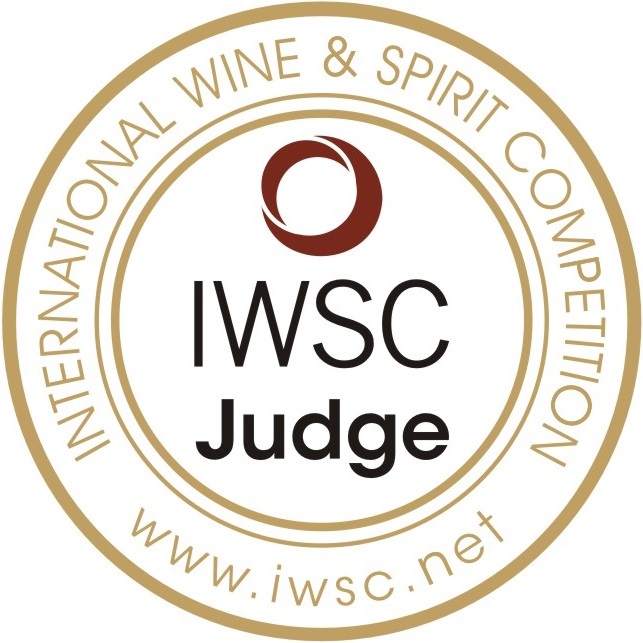 Hope to see you at the VIWF! I will be there Thursday and Friday…! the 500 to 600 dirty wine glasses from the tastings. Sounds wonderful! So happy for Howard! Had a great Sherry seminar and a Cab Sauv vertical tasting with Montes.